The government agency which oversees the MOT system has backed down after 18 months and released data which shows how often different makes and models of cars and small vans fail MOTs. The data has now been placed on the VOSA website, although only in the form of a pdf file of 1,200 pages, which is a format difficult to analyse. The agency insisted, for reasons that are unclear, that it would be several more days before it could supply the material in a more useful format such as a spreadsheet. However The BBC’s Martin Rosenbaum converted the pdf into an Excel spreadsheet which he posted here, so that motorists can analyse it themselves if they want to do so. The information relates to MOTs in 2007, since that was the latest annual data when the BBC's FOI request was made in July 2008. VOSA now says it will issue the 2008 and 2009 statistics later this year, and will publish this material routinely in future on an annual basis. The figures give average MOT failure rates for individual models of cars and small vans, as well as breaking them down by year of manufacture. Not surprisingly older vehicles fail more often, and older models therefore tend to have higher average failure rates. However Martin Rosenbaum has used the spreadsheet to examine vehicles first used in 2004, which were therefore all three years old in 2007 at the time generally of their first MOT. "Pass rates will be determined by a wide range of factors, but particularly the level of use, ownership profile and the frequency of servicing or regular maintenance." "Many of the failed items highlighted in this report, such as brakes, driver's view of the road, reg plates and tyres, are directly attributable to vehicles that have covered above average mileages. 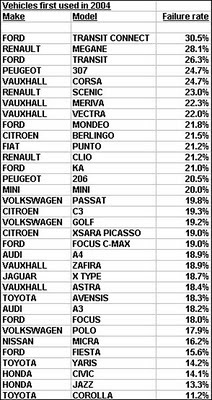 Since Vauxhall was one of the largest suppliers of fleet vehicles during the period surveyed (2004-2007), and fleet vehicles typically cover higher mileages than most, it comes as no surprise that some of our cars appear in this list." There is clearly an enormous wealth of information in the 1,200 pages now available. It's possible to examine all sorts of angles - how less popular models fare, the records of individual manufacturers, how failure rates for various models change over time, the different kinds of reasons (brakes, lights, steering, and so on) which different models are most likely to have problems with. One small point to note: it's rare for a data set as large as this not to contain some errors and you can see this one isn't perfect. For example, one MOT testing station seems to think there's an Audi 80 out there which was first used in 1883.